Munchie officially has a favorite toy. It is this book called Silly Tails. We received it as a gift from a dear friend (Franma) and I know for a fact that it came from our favorite toy store… The Dancing Bear. The pages are cloth, but stuffed with a material that crinkles/crunches. Each page has a silly animal tail sticking out… like a fuzzy tail, a stripy tail, etc. Munchie can hold onto the tails and easily turn the pages. He likes to chew on the tails… which is just fine with me… because I can chuck the entire book into the washing machine. Some kids snuggle with a blanket… others a stuffed toy… my kid snuggles up with his Silly Tails book and nods off to sleep. 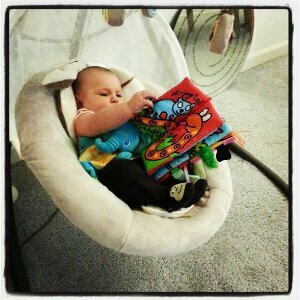 This is starting to become his favorite toy… and for good reason! I am beyond thrilled that he has fallen for a BOOK. One neat feature of this book is a little velcro tab. I can attach it to his carseat, stroller, etc. They even use that non-violent velcro that doesn’t scratch. KUDOS to you Silly Tails! I know these books are kind of pricey… but they are totally worth it. You might not be able to identify all of the animals, but I don’t think that’s the point. Use your imagination!